As many of you know, a lot of careful planning goes into the production and filming of a television commercial. But, sometimes, even the best laid plans . . .
As a writer on the Kentucky Fried Chicken (KFC) account at Leo Burnett in Chicago, I was privy to and sometimes involved in KFC’s experiments with new food products and new ideas for expanding their operations. Many of these efforts were directed at gaining market share from McDonald’s, their biggest competitor. During my time on the account, KFC was in the process of not only testing the competitive waters with a combination takeout/sit down restaurant (they only had takeout facilities at the time), but also with a restaurant-style menu that included a hamburger. They built an experimental restaurant in Phoenix, Arizona called “The Colonel’s” where they could test market the takeout/sit-down restaurant concept, along with the menu items. My art director partner Glenn Fujimori and I were involved with the project from the get go. We not only created an introductory television commercial, but Glenn was also involved in suggesting color schemes and interior design ideas for the new restaurant. After months of prep work, we flew to Arizona for the commercial shoot. Kentucky Fried Chicken brought in home economists from their headquarters in Louisville to work with the food stylist contracted by the film studio. The KFC home economists brought along one-of-a-kind food products such as onion rings, French fries, roast beef, milk shakes, the new hamburger and so on. All were specifically developed for the sit-down restaurant menu and were not available at any KFC takeout. 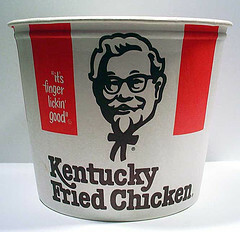 The KFC home economist and “The Colonel’s” restaurant staff were to prepare everything on premise for the film shoot. The idea of the commercial was to announce that something was changing at Kentucky Fried Chicken. The commercial opened with a trio singing and strutting in front of a KFC takeout restaurant that would magically transform into “The Colonel’s” new sit-down restaurant. Once inside, the singers would introduce and serve the never before offered food items. in front of “The Colonel’s” sit-down restaurant. 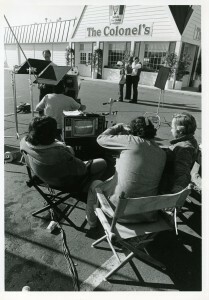 The greater part of the first morning was spent filming the opening sequence on location at the takeout restaurant. Just prior to lunch, we moved with the crew and equipment to the sit-down restaurant location on the other side of town for the outside shots of the new restaurant. 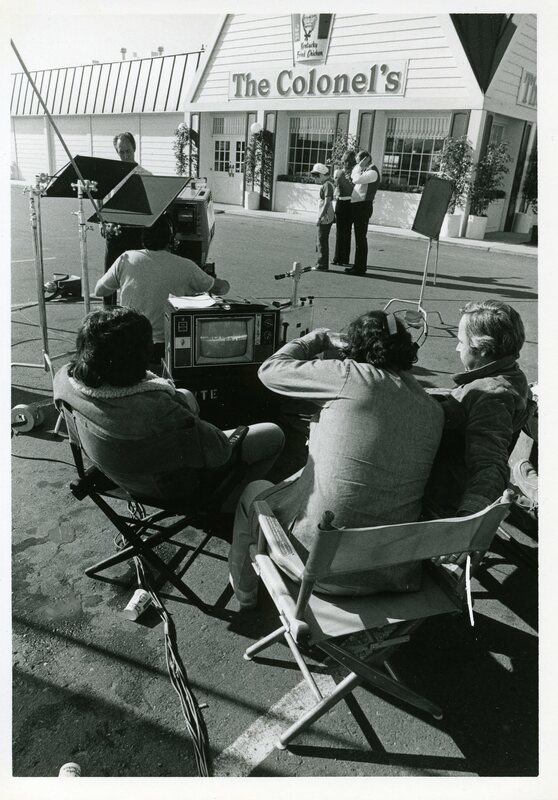 The next day, the singers would be filmed inside the restaurant as they served and introduced the new menu items. We would also film close-ups of customers eating and enjoying the food, idiomatically known as the “bite and smile” shots. On the second morning, we arrived around eight. The KFC home economists and local staff and cooks, who would eventually operate the new sit-down restaurant, had been at the location since 6:00 a.m. preparing the new food items. The next few hours were spent rehearsing the singers and actors and filming close-ups of the food. We planned to film the food being served and eaten in the afternoon. About 1 p.m., the Assistant Director called lunch. A bunch of us, clients, account people, the director and the creative staff, drove off to a restaurant for lunch. We returned about an hour later. I was sitting in an out-of-the-way booth watching the cinematographer set up the first shot. Suddenly I noticed an unusual amount of activity around the kitchen area. I wandered over. As I walked up I could see Glenn, the agency producer Don Simmons, and the film director in an animated conversation. Members of the crew surrounded them. I wedged my way into the circle. Don informed me that the KFC staff ate a majority of some of the new menu items for lunch. 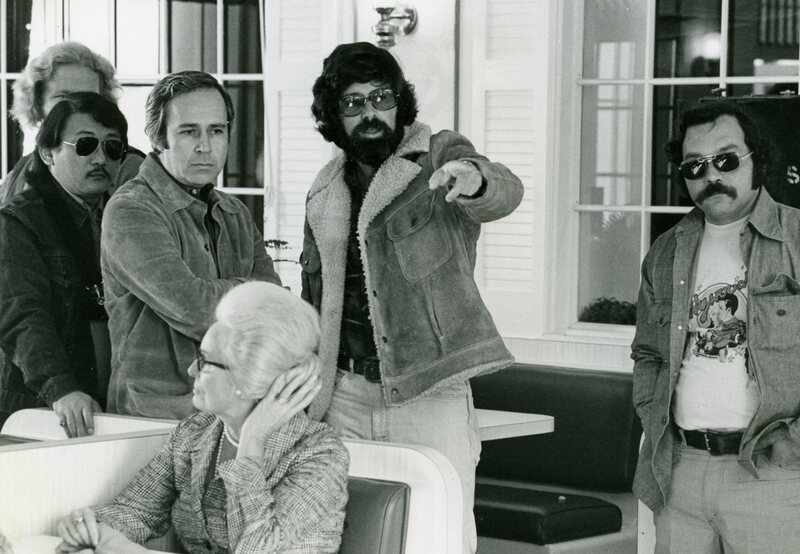 Director Steve Dollinger explaining to agency producer Don Simmons and art director Glenn Fujimori how they could juggle the shooting sequence while waiting for the replacement food to arrive. The writer is the handsome guy on the right. My mouthed dropped in disbelief. I think I mouthed the words: “They ate the food?” I remember people shaking their heads in agreement. If you ever worked with food in a commercial, you know it involves a lot of takes and a lot of food to get that perfect bite and smile shot. And then multiply that by at least three food items being eaten by three different people and . . .
Fortunately, we had a prop master by the name of Romero working our shoot. I’ve worked with him before. If you were shooting in the middle of the desert and decided you needed a set of bagpipes, Romero would drive off and return fifteen minutes later with bagpipes. I’m exaggerating, but it was pretty close to the truth. If you needed anything, you could count on Romero to find it. Romero quickly dispatched a squadron of production assistants and crewmembers into Phoenix. In about an hour, they came back with food items from various grocery stores and specialty shops that matched the original products so closely in size, color and texture that even the KFC home economists couldn’t tell the difference. The filming continued without a hitch. Got an advertising story? Share it. Add it as a comment to this story.